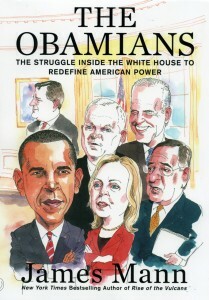 In THE OBAMIANS: The Struggle Inside the White House to Redefine American Power (Viking; On-sale Date: June 14, 2012; ISBN 9780670023769; 400 pages; $26.95), bestselling author and acclaimed reporter James Mann, takes readers inside the back rooms of the White House, Pentagon, State Department and CIA to reveal the interplay of events, ideas, personalities and conflicts that drive America’s foreign policy at the highest levels. Having written the definitive book on Bush’s war cabinet (The New York Times bestseller, The Rise of the Vulcans), and a nuanced exploration of the true nature of Reagan’s role in ending the Cold War (The Rebellion of Ronald Reagan), Mann now provides the definitive book on Barack Obama’s foreign policy team. At the heart of the foreign policy struggle are the generational conflicts between the Democratic establishment—still influenced by the legacy of Vietnam—and Obama’s inner circle of largely unknown, relatively youthful advisors who came of age after the end of the Cold War. When President Obama took office in 2009, he brought with him a fresh group of advisors intent on carving out a new global role for America in the wake of the Bush Administration’s war in Iraq and the resulting mistrust of the United States throughout the world. Mann has conducted hundreds of interviews with prominent government officials, politicians and those close to Obama. THE OBAMIANS provides stunning new details as Mann takes readers through the Obama administration’s foreign policy efforts. Exhaustively reported and lucidly argued, THE OBAMIANS is a compelling, even-handed account of the administration’s struggle to enact a coherent and effective set of policies in a time of global turmoil. THE OBAMIANS is a sequel of sorts to The Rise of the Vulcans, which was described by Michiko Kakutani as “compelling … lucid, shrewd, and … blessedly level-headed.” No other book so far has provided such a global accounting of this historic president and his inner circle, and of how Obama’s policies may or may not continue to shape America and the world. James Mann, admired for his balanced view of politically polarized issues, is uniquely qualified to write this book.